The paint hasn’t dried yet on the new Windows 8.1, but users across the world are already looking ahead in Microsoft’s product release cycle and are now calling for the company to bring the new Windows 9 to the market sooner. 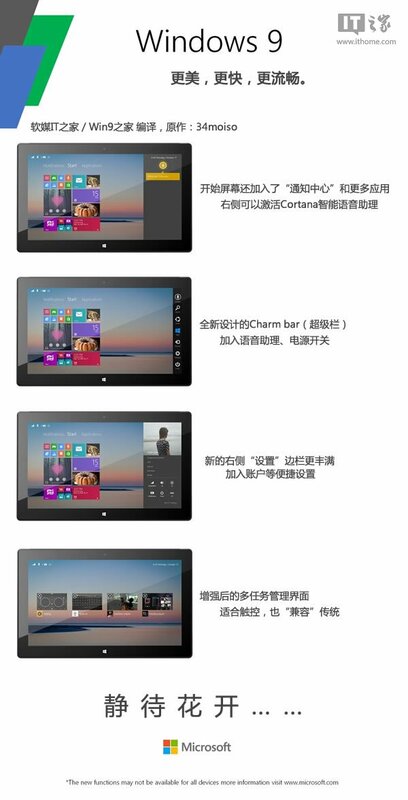 A concept created by 34moiso and published by Win8China showcases a significantly improved Windows 8.1 version that could hit the market as Windows 9 and bring several major updates, including a reworked Charms bar. While the low-resolution photos do not show these improvements in detail, the new Charms include options to restart and shut down the computer faster, as well as shortcuts for the settings screen. What’s more, the concept is said to be packing Cortana, Microsoft’s voice control system and Siri rival that’s supposed to arrive on Windows Phone platforms in the coming months.